Foo Fighters have established themselves as a premier alternative rock band, offering a mixture of bittersweet harmonies and full-on rock anthems. Their formidable live act is second to none, and Everywhere But Home cements their reputation with a combination of stadium shows, festival appearances, and intimate acoustic performances. Endearing behind the scenes footage illustrates the goofy nature of the band, with singer Dave Grohl displaying all his gentlemanly charms. 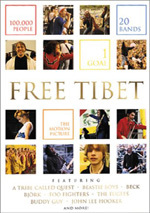 Tracks include "Monkey Wrench," "All My Life," "Learn To Fly," "Everlong," and more. When Nirvana came to a violent end 10 years ago, few thought anything much would come from the band’s ashes. Kurt Cobain’s widow Courtney Love seemed like she had a future; released right around the time of Cobain’s suicide, her band Hole’s album Live Through This proved to be a hit with critics and music buyers. Love later established some success as an actress via projects like The People Vs. Larry Flynt. However, the unstable Love essentially self-destructed and never could capitalize on her potential. The two surviving members of Nirvana included bassist Krist Novoselic and drummer Dave Grohl. A founding member along with Cobain, Novoselic presented the apparent main hope for something creative after the band’s demise. That never happened, as the bassist meandered through the rock landscape. If anyone predicted success for Grohl after the band’s finish, I can’t recall those voices in the wilderness. I figured that if he resurfaced again, it would be as a hired hand in some other band. How wrong I was! Grohl formed a new outfit called Foo Fighters and released a surprisingly bright and engaging album of the same name in 1995. Since then, Foo Fighters have put out three more albums: 1997’s The Colour and the Shape, 1999’s There Is Nothing Left to Lose, and 2002’s One By One. Each proved to be a nice success, and Foo Fighters gradually emerged into an arena band. Hard to believe that the guy we thought would always be known simply as “former Nirvana drummer” for the rest of his life established a post-Nirvana career with greater stability and endurance, but there you go. I’ve been very happy to see it, largely because Grohl seems like a great guy. He’s one of the wittier rock stars you’ll find, and a local boy to boot; like me, he grew up in Northern Virginia. Performed at the Arrow Theater, the Toronto concert comes almost complete. For reasons unknown, it loses one song: “The One”, originally found on the soundtrack of Orange County. The remaining 15 songs present a sampling of Foo history. From One By One we get five tracks: “All My Life”, “Have It All”, “Low”, “Times Like These”, and “Tired of You”. Lose presents another five numbers: “Stacked Actors”, “Breakout”, “Learn to Fly”, “Generator” and “Aurora”. We find four more tunes from Shape: “My Hero”, “Hey, Johnny Park!”, “Monkey Wrench”, and “Everlong”. That leaves “For All the Cows” as the lone representative of Foo Fighters. I’ve seen Foo Fighters live a few times and think they put on a good show. Much of this comes from Grohl’s wisecracking and irreverent personality. He’s a performer I often wish would stop singing and just talk instead; he’s so damned funny that I sometimes look forward to the between-song banter more than the music itself. Home seems better for its music than for its visuals. Frankly, Foo Fighters aren’t the most fascinating band to watch, at least not on TV. Again, within a live setting, the energy carries the day, but on video, we just don’t have a whole lot to stimulate us visually. Grohl isn’t a magnetic frontman, so the band overall fail to give us much to watch. Despite the irritation of Grohl’s vocal idiosyncrasies, the music on Everywhere remains good. Foo Fighters are a pretty tight band live, and they open up the music well. They don’t remain slaves to the studio versions, but they also don’t just meander and play extended renditions with no real point to them. I can’t call them one of the great live acts musically, but they give the material nice depth in that setting. Everywhere But Home ultimately feels like a fair rendition of a fair concert. Director Maurice Linnane keeps the action well focused and doesn’t rely on too many gimmicks to convey the material. Neither the video nor the show seems particularly notable, but both are generally positive. 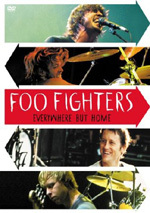 Foo Fighters: Everywhere But Home appears in an aspect ratio of 1.78:1 on this single-sided, double-layered DVD; the image has been enhanced for 16X9 televisions. Not one of the best looking concert presentations I’ve seen but not one of the worst either, Home offered a reasonably satisfying set of visuals. Sharpness mostly looked good, though those elements varied. A mix of shots came across as somewhat ill defined and fuzzy, but those stayed reasonably minor. The show only sporadically achieved great clarity, but the images usually seemed fairly detailed and accurate. Fairly noticeable and frequent examples of jagged edges appeared, but I saw no instances of shimmering or edge enhancement. Some light video artifacts emanated from the source material, but no other issues interfered with the image. As with most concert presentations, colors stemmed mainly from the lighting, and those elements seemed erratic. Much of the time the hues appeared fairly firm and distinctive, but variations occurred. At times the tones looked somewhat thick and overly dense. Black levels usually seemed acceptably rich and dark, but they also occasionally took on moderate bluish tones. Shadow detail was decent but unexceptional. Low-light shots seemed fairly visible, but things could get a bit dim at times. Overall, Home looked good enough to merit a “B-“. Everywhere But Home came with both DTS 5.1 and Dolby Digital 5.1 soundtracks. Don’t expect any variations between the two. In comparisons, the pair sounded virtually identical and I discerned nothing to differentiate one from the other. The sound field remained pretty heavily anchored toward the front spectrum, but that seemed appropriate for the presentation. Vocals were well placed in the center, while instrumentation spread cleanly and accurately across the forward channels. As one might hope, the dual guitars split to each side of the spectrum, which makes perfect sense. The rears mainly added a little musical atmosphere as well as crowd noise. This supported the front logically and naturally. Unfortunately, the audio quality left something to be desired. That happened mainly because the program lacked much low-end material. Bass seemed flat and wan throughout the show. Midrange dominated the piece, and this made the mix sound somewhat thick and harsh at times. Vocals came across as appropriately natural most of the time, though the track poured on a little too much “arena echo”, which made the singing occasionally seem somewhat hollow. Guitars and drums packed good punch, though the paucity of bass left them without as much depth as I’d like. Don’t get me wrong: Home didn’t totally lack bass material. However, the piece failed to display substantial heft and came across without the kind of warmth I’d expect. That negatively affected the rest of the track and meant that it didn’t rate above a “C+” for audio. We find a mix of extras for Everywhere But Home. First we encounter a pair of songs from the band’s May 1, 2003, Washington DC concert. Grohl owns a stake in a nightclub called the Black Cat, and this small-scale show took place the night after their larger Patriot Center performance on the prior night. Home presents four songs from the concert’s acoustic set: “Doll”, “See You”, “For All the Cows” and “Everlong”. Packed together, these run 12 and a half minutes. With two songs not found in the main set and unusual renditions of the other two, this piece seems useful and fun to hear. It doesn’t hurt that Grohl provides a quick but funny monologue about how tough it was to find Foo songs that worked in the “unplugged” format. On August 23, 2003, Foo Fighters played as part of a massive outdoor show in Ireland at Slane Castle. They didn’t headline – Red Hot Chili Peppers took that slot – but they were one of the main attractions. From that concert, we find two tracks: “All My Life” and “Everlong”. Both songs appear in similar renditions during the main concert program, so they feel fairly redundant here. The video quality also seems lackluster, though the clips use an interesting format: for most of the time, we see two camera angles onscreen at the same time. This remains only marginally intriguing, though. 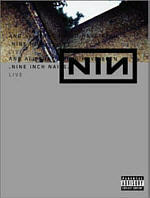 For the final musical portion of the DVD, we get an audio-only rendition of the band’s August 26, 2003, show in Reykjavik, Iceland. Offered with Dolby stereo sound, this includes the entire 17-song setlist. 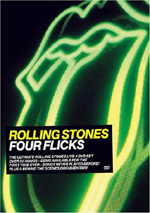 (That includes “Everlong” for the fourth time on this DVD!) The show runs about 90 minutes and doesn’t seem particularly notable when compared to the main Toronto performance; I don’t hear much to differentiate between the two, which makes this one more of a fun curiosity but not anything crucial. However, at least Reykjavik provides two songs absent from the Toronto show: “The One” and “Weenie Beenie”. That gives us a decent little bonus. Finally, according to the back of the disc’s case, Home includes two photo galleries. I’m not sure if these appear as a DVD-ROM extra or if this refers to the pictures that show up as you listen to the Reykjavik show. My computer’s giving me some trouble with DVD-ROM playback right now, so I can’t check out those elements to determine what Home offers in that domain. Suffice it to say there’s no dedicated stillframe photo gallery evident on the main disc itself without possible DVD-ROM intervention. One of rock’s more surprising and endearing success stories, Foo Fighters are also a tight little band. We hear that well during the music found on Everywhere But Home. The concert doesn’t play as well on TV as in person, but the show still acts like a decent primer for Foo fans. Picture and sound quality seem marginally above average but don’t stand out as particularly strong. The DVD includes a nice set of extras highlighted by an addition complete audio-only concert. Foo fans will dig this pretty good package. With a very low list price of $14.98, you can easily buy this DVD for less than the cost of a CD – given the hours of music it packs, that’s a terrific bargain.